When eating only whole non-processed foods, I like to find ways to enjoy the flavors of the more processed less ideal foods. I love pizza! 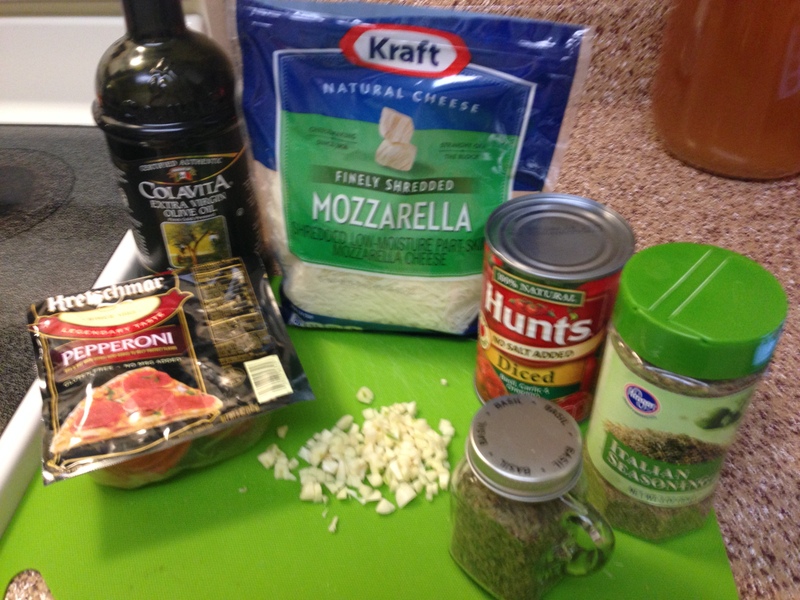 And I have been kicking around the idea of trying to make a cauliflower pizza crust…..but I had an eggplant in my refrigerator already. 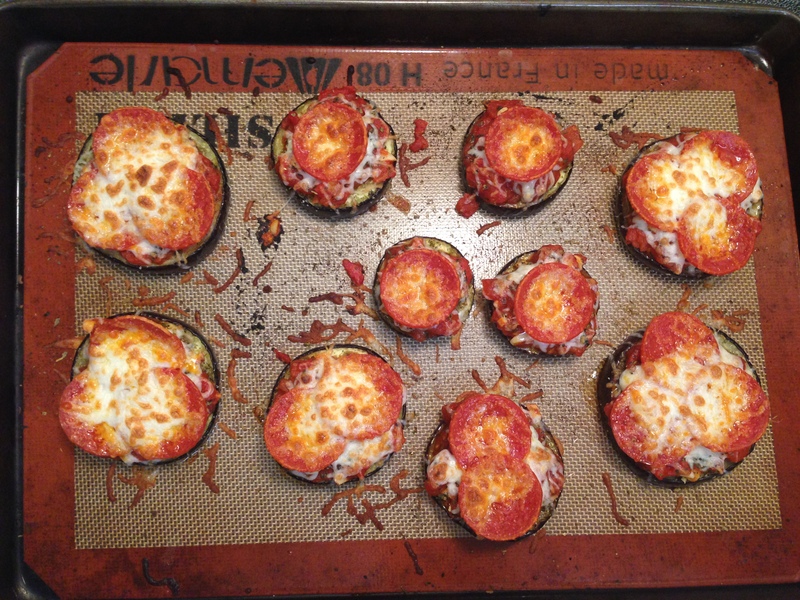 I think these can also be made in zucchini boats as well if you do not like or cannot eat eggplant. Side note: I think that the next time I make it, I might add in a small amount of onion and green bell pepper for flavor layering. Gather all your ingredients, including a sharp knife, chopping board, paper towels, a frying pan, and a baking sheet. Pre-heat your oven to 375 degrees. Start by chopping the ends off the eggplant and discarding or composting it. Then slice the eggplant about 3/4 of an inch think slices, for now leave the skin on. Lay out a double layer of paper towels and place the eggplant on them. Liberally salt both sides of the eggplant and allow to sit for about 20 – 30 mins to draw the water out of the eggplant. If you do not, they will tend to get mushy while cooking. While the eggplant is resting, chop up your garlic in relatively small pieces (also, onion and green bell pepper) if you so desire. Saute the garlic in the pan with some butter and salt, do not over cook or it will have a biter taste. Add in the petite diced tomatoes with some salt, pepper, and Italian seasoning, to taste. I was fairly liberal with all of them because the tomatoes and garlic is where most of the flavor from the dish will come from. While that is cooking down (most of the liquid will evaporate). 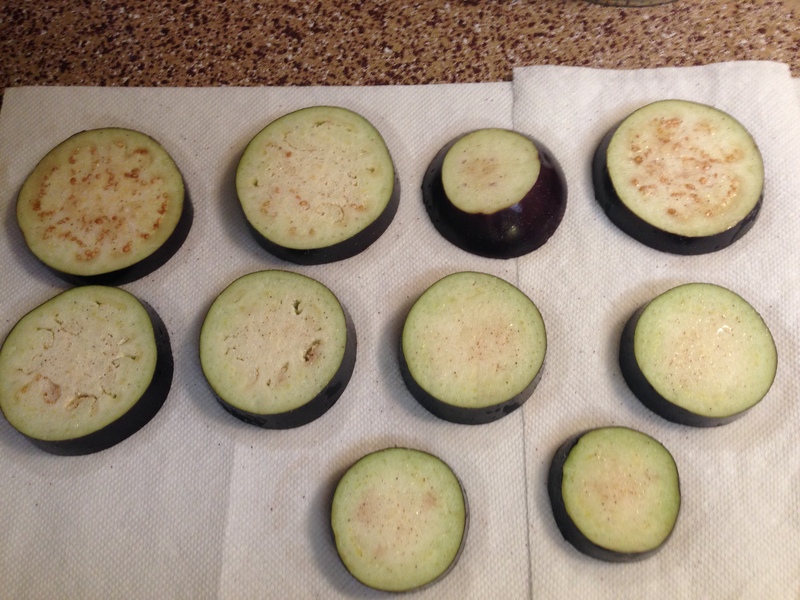 Use paper towels to blot and rub the salt off both sides of the eggplant. You will notice that the paper towels they were laying on is quite wet. Place eggplant on the baking sheet (a silicone liner or parchment paper will help them from sticking) and brush with olive oil. Season then with black pepper, Italian seasoning, and a little garlic powder. Place in oven for 25 minutes to cook. Do not over cook or the end result will be mushy; so if your oven runs hot keep an eye on them starting around 20 minutes. Once the time as lapsed, pull them out and turn on the broiler. While the broiler is rising to temperature, top with the tomato mixture (you shouldn’t have any left), mozzarella cheese, pepperoni, and a little more mozzarella cheese. Place under the broiler until the cheese is melted and a little brown. This took about 1 minute and 10 seconds in my oven! Let them sit for a few mins to cook a bit – they will be really hot and burn you. The little bit of cooling also allows for them to solidify together more like a pizza. After I plated mine, I slit the side of the skin and peeled it off; you can eat it if you want to.